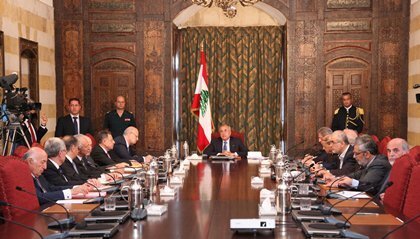 President Michel Sleiman proposed to Lebanese leaders Thursday a national defense strategy that would allow Hezbollah to keep its arms but place them under the command of the Lebanese Army, which would have exclusive authority to use force. In a country where a political compromise is always taken optimistically, where political agreements, unity governments and national dialogues are always considered beneficial even though they are most of the time useless, ineffective and unproductive, comes the latest invention: A consensual defensive strategy. This is a big step forward. But for many reasons, such a project shouldn’t cause so much enthusiasm. The Power Sharing. The first thing that struck me was the duality Hezbollah-State. Hezbollah will not be a state within a state anymore. It will be a vassal state within a state. Will the military wing still be called Hezbollah? Or will it be called resistance? What will be the authorities granted to these forces? Who will be their actual leader? If it is a joint Hezbollah-State committee that will regulate Hezbollah’s military wing’s affairs, who will name the members? and what will be the members’ roles? will their decisions be conclusive and trenchant? Will they take orders from the Army Commander, from the President, or from Hezbollah’s Secretary-General? What if the committee can’t agree anymore – just like what happened with the Arab League committee that was supposed to execute the Cairo Agreement in 1976 – and even fails to agree on an explanation of some decree? What if the agreement – like the Cairo agreement of 1969 – supposed to give back the sovereignty to its owners only complicates things and accelerates chaos? Will we have a “Resistance commander”, and if so, I ask the traditional Lebanese question: What shall be this man’s faith? And who will name him? The Structure and Parallelism. The main difference between the Lebanese Army and the Resistance is that the resistance boys don’t go public. You can take a ride in Beirut’s southern suburbs, and you will quickly notice that unlike all other Lebanese parties, there is not one public political bureau for Hezbollah. Their actions are top-secret, the location and type of their weaponry, and the names of some of their members are all unknown. Top military leaders might ask such critical information, and only God knows if there is another Fayez Karam in the army. Can they trust each other? Can the army and the resistance fully and smoothly cooperate with each other? Hezbollah primarily uses a guerilla warfare style, while the army is highly organised in Brigades, battalions, regiments and detachments lacking air support. And if there is an aggression who shall engage first? Should the army take part in the clashes? should the resistance wait for the army commander or government’s orders? Who will have the authority to appoint and dismiss soldiers and officers? Should the resistance be part of the supreme defense Council? And if so, will it be regarded as an independent apparatus like the ISF or will it be considered as a “guerilla brigade of the army”? And will the army have to take cover from enemy fire in case of an Israeli War, or will it be considered as a separate entity not engaging with the Israelis? Won’t the resistance gradually lose its efficacy and “secrecy” once linked to the army? Won’t the resistance military leaders become a bit more public, to the Mossad at least? The Politicization Process. Today, Hezbollah is in the government. Tomorrow, Hezbollah can be in a consensual government. The day after tomorrow, Hezbollah can be leading an opposition. Today, the Lebanese President is a consensual one with a military résumé. Tomorrow he might be backed by Hezbollah. He might as well be a fierce political opponent lacking military influence. How will the resistance members react in case of a government shift? Will they follow the Authority’s command? Or will they follow their traditional command? will Hezbollah give up its military branch and put it under the control of a President they don’t agree with? But more importantly, can the executive branch deal and cope with an opposition military apparatus under its control, and can the opposition military apparatus follow exclusively the orders of a government it might not share the same political opinion with? And what will be the role of Hezbollah’s political bureau? What will be the role of Hezbollah’s Secretary General? In case the government changes, who will be the true leader of the forces? The Army Commander? The president? The Government? Nasrallah? Can’t such a system create more tension that can spill over the army and degenerate in a civil strife? Military triumvirate are highly susceptible to collapse. Except that here, a collapse of the system can lead to a civil war. Is there a way back? Can Hezbollah’s political bureau claim its forces? Can they say 20 years from now “We want our military Wing Back”? And more importantly, can they have it back? Who has the authority to give it back? What happens if it comes back without that authority’s approval? What happens if that military apparatus separates into two sections, a pro-government one and a pro-Hezbollah one? What will be Hezbollah’s role in the political scene without its military wing? Will it be a Right-Wing Sectarian Shia Party supporting the resistance and working for its sake from the rows of the parliament? The Sectarian schizophrenia. Hezbollah isn’t only a usual party with a military wing. It’s a religious party with a religious military wing. The army, while keeping religious quotas within its high circles, is a secular army that doesn’t act on a religious basis and that for sure isn’t a hundred percent made from a certain sect. Is it legal or at least ethical to absorb into the military institutions a “monoreligious Guerilla Brigade”? And what will be the effects of such an action? Won’t there be a tendency to create religiously separate units, or at least dreams of creating such things? Will the resistance faction subject to religious change? And if so, will some of the current Shia members be dismissed and replaced by other members? Will the religious rituals still be part of the resistance? Will it take a secular coloration? Can a religious military entity be under the patronage of a secular one? What effects will it have on a Multi-confessional Lebanon? The Wages and Salaries. Another important question: Who will pay the soldiers their wages? Can the State afford paying Hezbollah members their wages? Will the State and the party pay together or agree on a certain quota? Will Hezbollah’s members be considered as equal to the ISF members, to the army members, or to a certain category of civil servants? Won’t this whole process require a law or at least the modification of one, to specify all the details on the wages that should be given to each grade of men within the resistance? And by the way, who decides who is a Colonel and who is a Sergeant in the resistance? The Arming And Maintenance. The Lebanese Army usually buys its equipments and arms itself from European pro-American States (Or USA). Hezbollah however has a Russian-Soviet-Syrian-Iranian weaponry, from the Katiouchas to the Raads. Will Hezbollah – and here comes the Irony – fight with an american M16 and a French rocket Launcher? Or will the Armed Forces diversify their sources depending on the concerned unit? And who will pay for the Grad rockets? Hezbollah’s bureau or the State that can’t even afford to asphalt some roads? The Visibility and Recruitment. Who will be able to enroll into the resistance? Or will it be a closed for newcomers? Will the keys of the military wing stay with the political bureau? Can the political bureau have a veto on the newcomers? Will the resistance have Barracks? Won’t that kill their useful guerilla strategy? And if they will keep their guerilla strategy, won’t it make things more complex for the soldiers of the army – For example – to find out that the armed men they were chasing are resistance men undercover? The Temporality and Durability. When shall the resistance apparatus be dissolved? When Israel will be dismantled? When the Palestinians refugees return to their homelands? When a Peace Agreement will be reached? And what if Hezbollah’s political bureau isn’t happy with such a peace agreement? What happens? The war of the “Resistance Succession”? The Diplomatic Problem. When Hezbollah’s military wing becomes an integral part of the Lebanese Armed Forces, what will be the reaction of the countries that consider Hezbollah to be a terrorist organisation? Will the terrorist accusations stop? Will the army be considered to be a terrorist army for incorporating a terrorist organisation? Will the Lebanese State start suffering sanctions? Can the Lebanese authorities avoid diplomatic repercussions? Can the United States or any other country still give military assistance to the army? In Every Single Annoying Detail. Posted in 14 March Alliance, Hezbollah, Lebanese Politics, Michel Sleiman, Politics on September 29, 2012 by Ramez Dagher. ← Is 1.6 Billion Enough To Equip The Lebanese Army?